While on duty in a hospital, Cadet Nurses wore the usual nursing student's uniform with a U.S. Cadet Nurse Corps patch affixed, normally on a sleeve, to distinguish them as Cadet Nurses. They were also issued dress uniforms that Cadet Nurses wore when off duty outside of the hospital. There were summer and winter uniforms, which included jacket, skirt, cover (hat), a winter coat and raincoat, a handbag, official epaulets, and pins and buttons decorated with the insignia of the U.S. Public Health Service. Your uniform is a symbol of what the U.S. Cadet Nurse Corps means to you. What it will mean to others will depend in large measure on how you wear it. In military language, you are in uniform if everything you wear is according to the "regs". If one article of dress is wrong you are out of uniform. It isn't just a matter of wearing summer suit or winter; reefer coat or raincoat. It is the slant of your beret, the snowy whiteness of your blouse. It is the way you walk, the way you stand. It is the dignity with which you wear the uniform of your proud profession. Your uniform is YOU. At the end of the war, there was a question about what to do with these uniforms. With the rapid demobilization of women in the armed services, the national spotlight is no longer focused on uniforms. Rather than assign your Cadet Nurse uniforms to mothballs—and oblivion—you can make them over into attractive civilian suits with minimum effort and expense. A noted fashion editor suggests removing epaulets, pocket tabs; change the buttons. If you want more complete variation, remove collar and lapels—you will have a good looking cardigan suit. Remove epaulets from your reefer, add a fur collar; consider dyeing all three pieces an exciting new color. Many Cadet Nurses apparently did not heed that advice, as a number of people have inquired about where these uniforms might be donated. Some of us are looking for a new home for this historic garment. 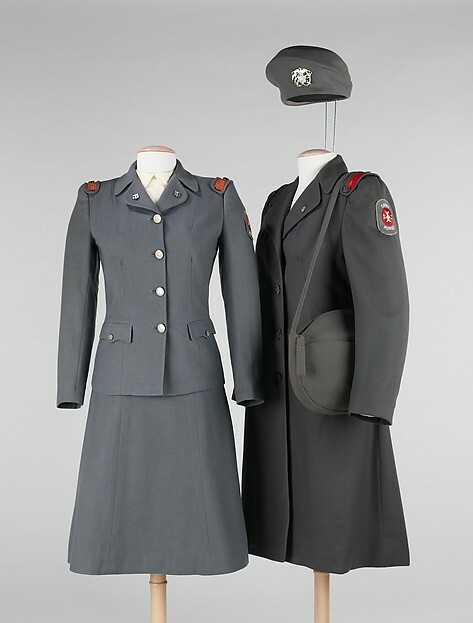 Some would love to receive a uniform so that they can display it at an exhibit or as a uniform re-enactment at an event. Both are powerful ways to ensure that Cadet Nurse Corps history is preserved for future generations.